Finished on two sides and neatly packaged in a wooden box. One side of the stone is medium and the other side is fine. Ideal for sharpening knives and gravers made of high speed steel or carbide. 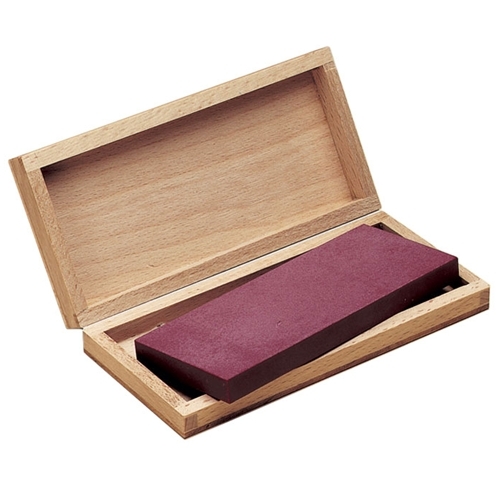 Measures 4-3/4"L x 2"W x 3/8"H.
Made in Germany from pure, sintered crystals of synthetic ruby. No bonding material is used, so these stones and files are extremely hard and resistant to changes in shape. This is particularly important for quality precision grinding and finishing. In addition, since Degussit Ruby Stones and Files feature outstanding resistance to wear, they are more economical to use than other comparable tools. Use dry or with Gesswein Stoning Oil to grind, touch up or debur steel and carbide parts. Also recommended for use on materials such as glass, quartz and porcelain.